A while ago I bought a bag of mint baking chips because they were on sale. What a silly reason to buy something! I put them in the freezer and promptly forgot about them. When I was organizing my overflowing freezer this weekend, I decided to finally get creative with the mint chips. I read the recipes on the back of the bag and they sounded plain awful… sweet mint is a strong flavor and one that I am particular about when it comes to baked goods. Then I remembered one of my all time favorite cookies- Mint Condition made by the Pacific Cookie Company. 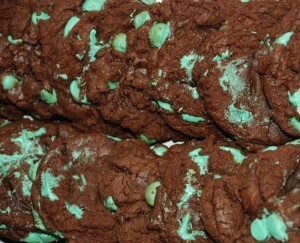 A large, dense, rich, chewy chocolate cookie with lots of mint chips. I found an America’s Test Kitchen recipe for chewy chocolate cookies and modified it to make it even chocolatier and chewier. I also substituted mint chips for the semisweet chips it called for. And, I’m happy to report that these cookies are just as good as the ones I was reminiscing about! A few tips: the cookies will be chewier and thicker if you refrigerate them as the recipe reccomends. If you don’t have time to refrigerate them for hours, at least put them in the freezer for 10 minutes or so before baking so that they don’t turn out thin and crunchy (unless you like that sort of thing). Also, when you pull these out of the oven, they will look underdone. Trust the timing and sample them when they are cool. I tried leaving some in the oven a little bit longer than the recipe recommended and they were fine warm, but once they cooled they were very crunchy and hard. The recipe makes about 3 dozen cookies or more, so feel free to halve it if you don’t need a bunch. You can also spoon the dough into balls and freeze them for up to a month, adding about 4 minutes to the cooking time when you decide to bake them. Chop semisweet and bittersweet chocolate into small pieces. Place chocolate pieces and butter in a double boiler and heat until melted and smooth, stirring occasionally, set aside. Whisk the flour, cocoa powder, baking powder, and salt together in a small bowl, set aside. Beat the eggs and egg yolk in a stand mixer on medium-low speed with the paddle attachment for two minutes. Add the vanilla, brown sugar, and white sugar, mixing on medium until combined. Add the melted butter/chocolate to the mixer and mix until well combined. Reduce the mixer speed to low and add the flour mixture slowly, until just combined. Form dough into 2 tablespoon-sized balls and then flatten them out slightly. Place dough balls onto cookie sheet, about two inches apart, and cover with plastic wrap. Refrigerate for at least 3 hours and up to 48 hours. 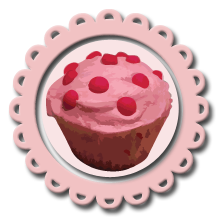 Remove plastic from baking sheets and place baking sheets in oven. Bake for 12-14 minutes, removing from oven when the outsides of the cookie look done (the centers/cracks will look undone). Cool on baking sheet for 5 minutes and on wire rack for 15 minutes. This entry was posted on Wednesday, April 1st, 2009 at 3:49 pm	and is filed under Cookies. You can follow any responses to this entry through the RSS 2.0 feed. You can leave a response, or trackback from your own site. Wow, those are palpable. Like minty flavor from the screen to my mouth.